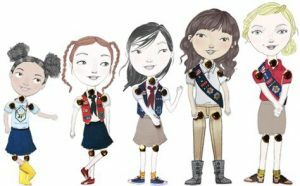 American Heritage Girls Troop 173 (AHG 173) serves the Pinehurst, North Carolina area. Founded in 1995, AHG now has more than 100 troops across the U.S. Vision: American Heritage Girls is the premier national character development organization for young women that embraces Christian values and encourages family involvement.Inclusion Policy: All biological girls of any color, creed, race, national origin and socioeconomic status who agree to live according to the standards of the AHG Oath and the AHG Creed are invited to be members of American Heritage Girls. Girls ages 5 – 18 meet on the 1st and 3rd Tuesdays of each month from 6:00 pm – 7:30 pm at the church to further the mission of ‘building women of integrity through service to God, family, community and country’. Our Board consists of AHG Charter Representative, Renate Yow; Coordinator, Grace Ogno; Treasurer, Andrea Walters; Troop Shepherd, Amanda Clark; Vice Coordinator, Ellie Weist. 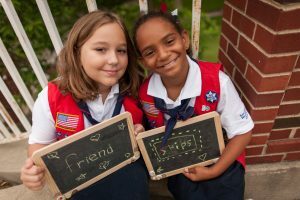 Girls can also earn Service Hours, and we are committed to arranging monthly service projects to help our girls earn service hours while encouraging girls to participate in service projects on their own.They also earn one hour of service for every 5 products brought to a Troop meeting for any of the following charitable organizations: BackPack Pals, God Sent Angels, or LifeCare Pregnancy Center. 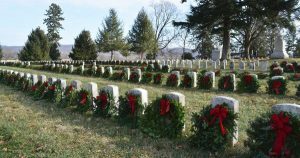 On Saturday, December 15, 2018 at 12:00 PM, American Heritage Girls NC0173 will be helping Sandhills State Veterans Cemetery to Remember and Honor our veterans by laying Remembrance wreaths on the graves of our country’s fallen heroes. Please help us honor and remember as many fallen heroes as possible by sponsoring remembrance wreaths, volunteering on Wreaths Day, or inviting your family and friends to attend with you. To sponsor a wreath, please click HERE.